This huge, complex loop was ejected at high speeds over the west limb of the sun. 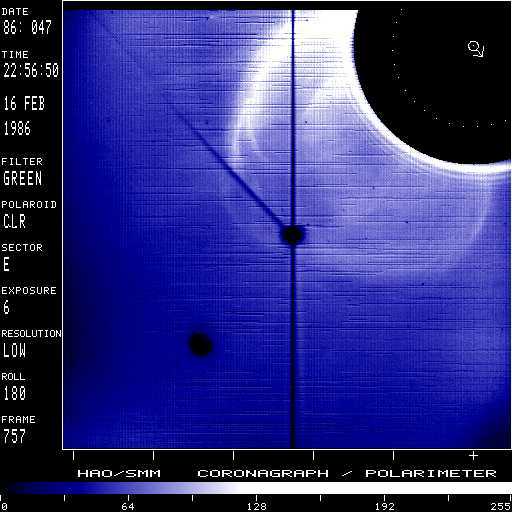 Note that solar north points toward the lower right corner as indicated by the arrow drawn into the occulting disk; the dotted circle marks the solar photosphere. Big loop/cavity with possible fuzzy, inner loop/cavity superposed on streamer and rays. Large deflections. Streamer is disrupted. NOTE: Image is rolled 180 degrees.